The Diamondbacks have gone in a strange direction since GM Dave Stewart took the reins. The club spent big in the Cuban market to acquire Yasmany Tomas and Yoan Lopez. The investment in Tomas already appears to be in jeopardy. The club jettisoned catcher Miguel Montero to the Cubs in exchange for salary relief. They replaced him with Tuffy Gosewich. The Diamondbacks talent is unevenly distributed. They own one of the best hitters in the game, but he's the only bonafide star on the roster. The rotation is deep, but everybody projects to be below average. The Diamondbacks have opted for the “see what sticks" method of pitcher selection. Collmenter has been named the opening day starter, and it's probably safe to assume they didn't trade two prospects for Hellickson so they could stash him in long relief. Corbin is working his way back from Tommy John surgery. He'll be their best pitcher upon returning. Collmenter is a deceptive, soft-tossing righty. He relies on poorly hit fly balls with his odd, over-the-top delivery. He uses a cutter and change for most of his work, although he also has a lousy curve. He won't strikeout many hitters, but he also limits walks. Fantasy owners should only use him for stream starts. Hellickson is a very different pitcher than Collmenter, but the use case is the same. He won't induce enough strikeouts to be a fantasy regular, but he will have the occasional advantageous matchup. Oh boy. A whopping 14 starting pitchers reported to camp for the Diamondbacks. Of those not mentioned above, Chase Anderson, Trevor Cahill, and Archie Bradley are the most interesting. Bradley is heavily disadvantaged since he has yet to debut. It's tempting to manage his service time no matter how well he performs this spring. Keep an eye on prospect Aaron Blair. He could beat Bradley to a regular role. Anderson's 2014 performance was enough for me to tab him as the best uninjured pitcher on the roster. He uses two fastballs (neither of which were good), an excellent changeup, and a plus curve. If he only had a better primary pitch, he could be a reliable fantasy arm. Maybe he'll develop a cutter. I'd still take him over Collmenter or Hellickson, which is why I foresee him making the rotation. Cahill is one of the few Arizona pitchers being paid substantially more than the league minimum. For that reason alone, he'll get a long look in the rotation. The 27-year-old has been around forever, but he's still younger than some of the “prospects" in camp. He's a sinker ball specialist. His half dozen secondary pitches perform well because they're seldom used. He's tantalized fantasy analysts for years. Reed and Ziegler will miss the early portion of the season with various ailments. A healthy Reed is a solid reliever, although he wouldn't close for most teams. Until recently, Ziegler was viewed as a righty specialist. One good season against left-handed hitters is not enough to convince me he's a full inning guy. While his betters are sidelined, Marshall will get a crack at saves. The club hid him from lefties last season, as evidenced by his 49.1 innings in 57 appearances. His platoon split wasn't large, and we don't have enough data to make any related statements. Expect about 9.00 K/9, 3.25 BB/9, and a 3.40 ERA. Marshall will have competition – namely every starter who doesn't crack the rotation. Delgado is the most prominent option to fill the role. His stuff played up out of the bullpen last season. A 4.40 ERA in relief isn't impressive, but he did notch 11.45 K/9. If he tempers the free passes (4.11 BB/9), he could be a decent emergency closer. Paul Goldschmidt is a force. A.J. Pollock might be somebody. 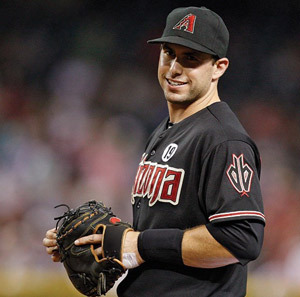 What do we make of Tomas, Chris Owings, or Mark Trumbo? The components of a good offense are present; it's just unclear if they'll all click. Pollock causes some arguments. In 287 plate appearances, he popped seven home runs, swiped 14 bases, and hit .302 without a crazy BABIP. The NFBC crowd isn't buying. They're selecting him 182nd overall - 30 picks after Leonys Martin. Pollock has never hit more than 10 home runs in a season, so there is some healthy skepticism about his newfound power. That said, he's entering his prime. Watching him play, it looks like he should be able to hit for some power. Perhaps as much as 15 to 20 home runs annually. Sometimes, similar looking players also manage just five home runs. The eye test is not perfect. The same eye test had me expecting 15 or more home runs from Michael Brantley for years. Sometimes it just takes time for things to click. I like Pollock more than the NFBC crowd, but maybe not as much as the folks at FanGraphs (125th). Tomas is the enigma of draft season. I had the opportunity to watch him play while in Arizona last week. Unfortunately, he was the designated hitter, so I didn't get a look at his fielding actions. From the early reports, it sounds like he's a dreadful defender. At the plate, Tomas demonstrated poor plate discipline. It wasn't a controlled aggression either. He repeatedly flailed at bad pitches. You might have noticed a Dayan Viciedo comp floating around the internet. It's not a lazy link to a fellow Cuban – he legitimately looks the same. I enlisted the help of swing expert Dan Farnsworth to evaluate both hitters. They share many of the same flaws and characteristics. I'm not buying. He's been selected 158th on NFBC, but many of those selections came before the start of spring training. Trumbo is getting some love from the drafters thanks to 40 home run power. He's never actually crossed that lofty threshold, but it's easy to see how he could at a hitter-friendly park. Injuries wiped out our memory of a slow start to 2014. He's a classic high risk, high reward selection. At 100th overall, I'd rather aim for somebody with a higher floor. Chris Carter is being selected later in some leagues. Owings has been one of my favorite sleepers since last spring. A partially lost season has allowed him to remain sleepy. Those crafty NFBC folks are letting him slide to 255th overall. He has the ability to pop over 10 home runs and swipe 15 bases with shortstop and second base eligibility. A former teammate of both players described him to me as a Michael Young clone – complete with future move down the defensive spectrum. For now, let's hope he worms his way to the top of the order. The Diamondbacks have the dubious honor of placing 26th in our power rankings. A top five slugger and a handful of options with upside populate the lineup. Until they acquire a real major league catcher, they'll basically be hitting two pitchers on a daily basis. It will be hard to produce many sustained rallies with multiple easy outs. The pitching staff is ugly top to bottom. They'll need several breakouts if they want to contend. Crazier things happen, especially with a massive quantity of depth at hand.